Or:la at the 2015 GIT Award Launch at 24 Kitchen Street. Or:la has built a growing and deserved reputation as a DJ, Getintothis’ Stephen Geisler heads to the all-out rave at Kitchen Street to find out why. 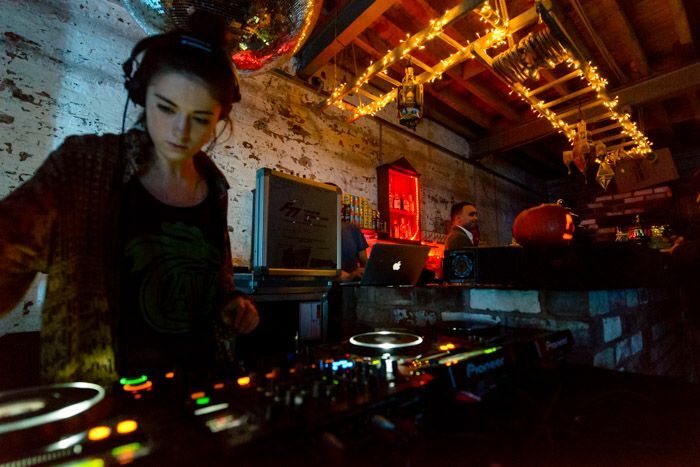 The vibe was on point at 24 Kitchen Street, as Or:la executed her very first all-night DJ set, courtesy of The Wonder Pot. With a totally sold out and packed night (at least by the time it all kicked in) it was clear that Or:la’s reputation in these parts is unmistakable. By the sheer number of people, and the unspoken anticipation evident in everyone’s faces, it was obvious that all attendees were already aware that this was going to be a banger. Or:la’s presence as a DJ is very reserved, at the start it seemed barely noticeable that she was even there, but when all the lights went out and the bass got loud, she made herself known to all and by all. She put on a wicked night, and had the crowd reeling by the end of it. Arriving early in time for the doors opening at 10pm, the night got off to a slow start, but Or:la’s set quickly proved that she had done this before, and knew exactly what to expect from her audience. As the night went on and the the crowd grew, everyone became increasingly involved, transitioning from a casual dance outfit to an all-out rave. Or:la sure knows how to hype an audience. The build from a casual set to a complete banger was bold and very noticeable from start to finish, but to the crowd, completely seamless. Or:la’s reputation at 24 Kitchen Street is unrivalled, and she can sure draw an involved and energetic crowd. If you missed this one you can catch her again on March 11 when she plays the same venue with Blawan. A mad one is guaranteed.